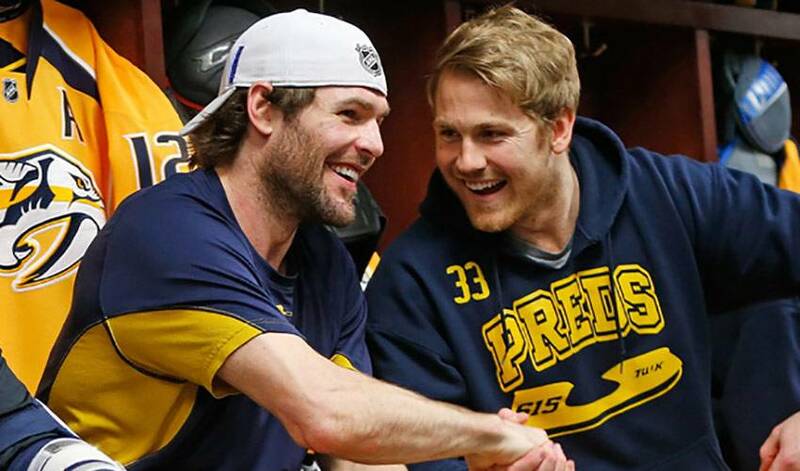 The beginning of his NHL career wasn’t the dream start Mike Fisher had envisioned. But, the veteran forward refused to hang his head, making his recent milestone moment that much sweeter. Just 32 games into his big-league life, one that produced nine points and ample reason to believe the kid from Peterborough, Ontario could be an impact player, a knee injury on December 30, 1999, felled Fisher, sidelining the rookie for the rest of the season. And that’s just what Fisher did. That unwavering commitment to the game, through good times and bad, went a long way in enabling Fisher to reach the 1,000-games plateau on March 3, a home game that saw Nashville host New Jersey. While it’s a coveted individual honour, the 35-year-old views it as a shared success. Before he’d ever played a game in the NHL ranks, the line on the 6’1”, 215-pounder read something like this: great skater, solid contributor in both zones, great attitude, solid second- or third-line centre prospect. His three-year tenure in the Ontario Hockey League, one season with his hometown Peterborough Petes and two campaigns with the Sudbury Wolves, was impressive. He produced seasons of 26, 24 and 41 goals, respectively, and was revered for his checking skills. Fisher, one of the Nashville’s alternate captains, recorded his first NHL point on October 21, 1999. He’s also grateful for the widespread backing he’s received throughout it all. “I would like to thank the fans for the amazing support I've had over my career and I'm very grateful for them,” said Fisher, whose extensive charitable work includes Room In the Inn, a full-service homeless facility located a few blocks from Bridgestone Arena and Cottage Cove Urban Ministries, a Nashville-based non-profit organization that serves inner city youth and Rocketown, a local youth outreach facility. A 12-year NHL veteran, Mike Fisher is a proven leader who has been instrumental in lengthy playoff runs as a member of both the Ottawa Senators and Nashville Predators. What do you get when you pair an American-born hockey player with a Canadian-born hockey player? What exactly does Colton Sissons do to help his team get the win? Just about anything you can think of. Austin Watson has been returned to available status and has entered the follow-up care phase of the SABH Program. The 28-year-old Ontario native stopped by NHLPA.com to offer up his five favourite non-hockey athletes, a list that includes a pair of soccer standouts and an NBA talent who always brings the Thunder.